The improvement is made possible by the newly launched ePayment system and shorter waiting time in securing online appointment slots (from 2 to 3 months in 2017 to as early as 2 weeks to 1 month nowadays). How soon can I renew my Philippine passport? How much does it cost to renew Philippine passport? How to Renew Philippine Passport in 6 Steps. 1. Prepare all the DFA passport requirements for renewal. a. Confirmed online appointment (see Step 2). b. Printout of the passport appointment packet (see Step 2). d. Most recent expiring or expired Philippine passport (with a photocopy of data page). e. Valid ID (original + photocopy). Option 1: Call the DFA hotline at (02) 737-1000. 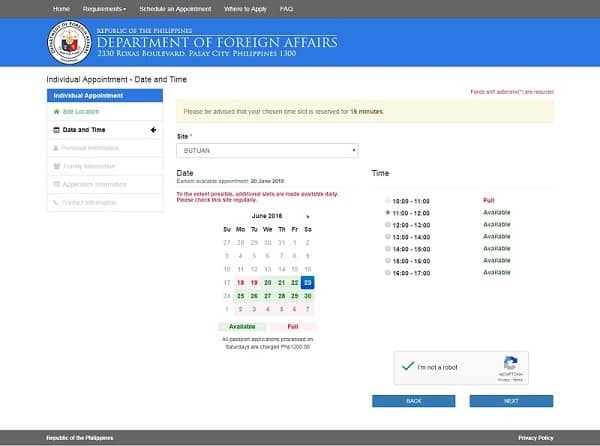 Option 2: Schedule an appointment online through the DFA Passport Appointment System. 3. Pay the Philippine passport fee at select ePayment channels. 4. Go to your chosen DFA branch on your appointment date and time. 5. Have your photo and biometrics captured in the Encoding section. 6. Pick up your renewed Philippine passport or wait for the courier service to deliver it. 1. I have an urgent need to travel but my passport has already expired. Can I extend its validity? 2. Can I request for additional pages in my passport once it runs out of pages? 3. My current passport has my maiden name. Can I change it to my married name/husband’s surname? 4. Should I transfer my valid foreign visas from my old passport to the new one? 5. Can I renew my Philippine passport even if it still has more than one (1) year of validity? 6. I entered wrong/misspelled information in the online passport appointment form. Can I still edit it even though my appointment is already confirmed? 7. What should I do if I didn’t receive an email confirmation? 8. Can I change my appointment location and schedule? 9. If my old passport was issued around the 1990s (or older) and I lost it through the years, is it still considered for RENEWAL or NEW Application? 10. I wasn’t able to show up on the date of my passport appointment due to some emergency. Can I still reschedule it? 11. Who are exempted from passport appointment? 12. I just received my passport but noticed there’s a typographical error/incorrect information. What should I do? 13. My child is a minor/baby. How can I renew his/her Philippine passport? 14. 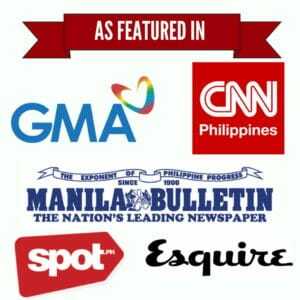 Is birth certificate still required in Philippine passport application/renewal? 15. I currently live/work abroad. 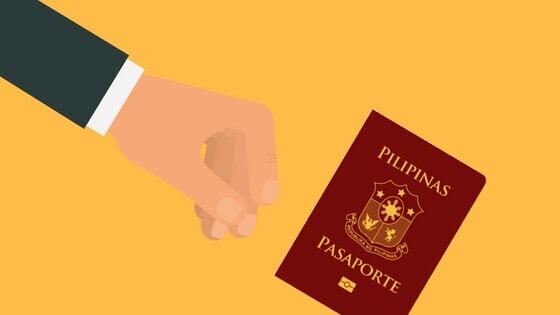 How can I renew my passport without flying back to the Philippines? 16. Does the Philippine passport number change after renewal? For a complete list of documentary requirements needed to replace the above-mentioned passports/documents with the latest Philippine passport, click here. If you own one of these passports, follow this step-by-step guide on how to get a new one. a. First, there are countries that have adopted the “6-month rule,” meaning they don’t allow entry of travelers whose passports have less than 6 months of validity upon arrival. Afghanistan, Algeria, Bhutan, Botswana, Brunei, Cambodia, Comoros, Côte d’Ivoire, Ecuador, Egypt, El Salvador, Fiji, Guyana, Indonesia, Iran, Iraq, Israel, Kenya, Laos, Madagascar, Malaysia, Marshall Islands, Myanmar, Namibia, Nicaragua, Nigeria, Oman, Palau, Papua New Guinea, Philippines, Rwanda, Saint Lucia, Samoa, Saudi Arabia, Singapore, Solomon Islands, Sri Lanka, Suriname, Taiwan, Tanzania, Timor-Leste, Tonga, Tuvalu, UAE, Uganda, Vanuatu, Venezuela, and Vietnam. b. All Philippine passports are printed in the Philippines to prevent the proliferation of counterfeit documents. If you’re based abroad, it may take between 1 and 3 months for your Philippine passport to be processed and delivered to you. So in addition to the 6 months of validity required by some countries (including the Philippines), you also have to factor in the time it takes for you to get your renewed passport. Philippine passport renewal fees depend on where you make the appointment/transaction. As summarized above, you may avail of either regular processing or express processing (if you want to receive your passport faster). 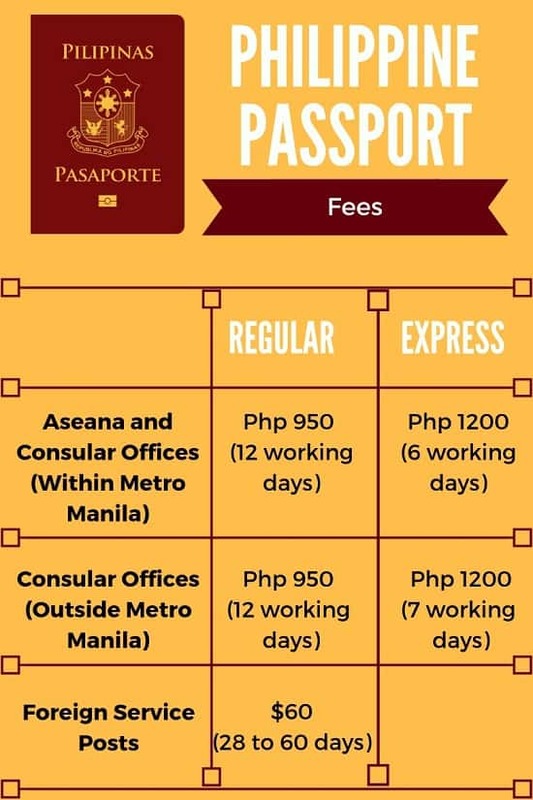 Passport renewals in Aseana or Consular offices in Metro Manila cost Php 950 (regular; released in 12 days) or Php 1,200 (express; released in 6 days). If you make an appointment in any of the Regional Consular offices outside Metro Manila, the cost of passport renewal is the same with the regular passport released in 12 days and expressed passport in 7 days. Take note that these waiting time are only applicable to those who will personally claim their passports at DFA. Additional days may be needed if you have availed of the courier service. Meanwhile, Filipinos abroad may visit a Foreign Service Post in their host country to have their passports renewed. The renewal fee is $60 but it may take up to 2 months (28-60 days) before you can receive it since all Philippine passports are printed in the Philippines. Take note that those with lost or mutilated ePassports have to pay an additional Php 350 as penalty fee when renewing their passports. 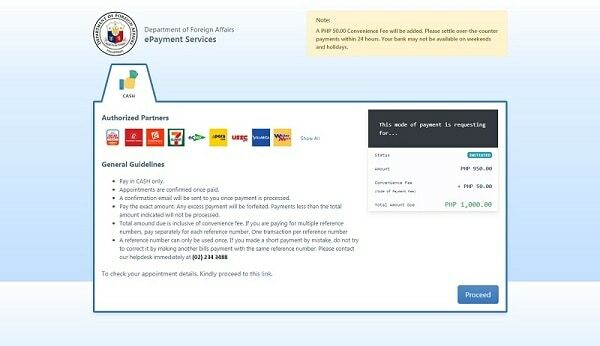 This fee is only applicable to those applying in the Philippines and may vary depending on the Foreign Service Post in your host country. Whether you’re applying for the first time or renewing your Philippine passport, DFA always requires an online appointment. 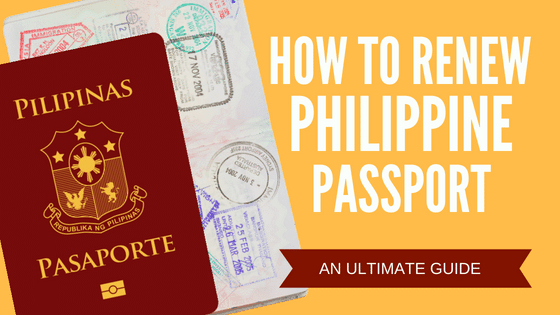 This section provides a step-by-step guide on how to renew a Philippine passport. Listed below are the basic requirements for Philippine passport renewal. 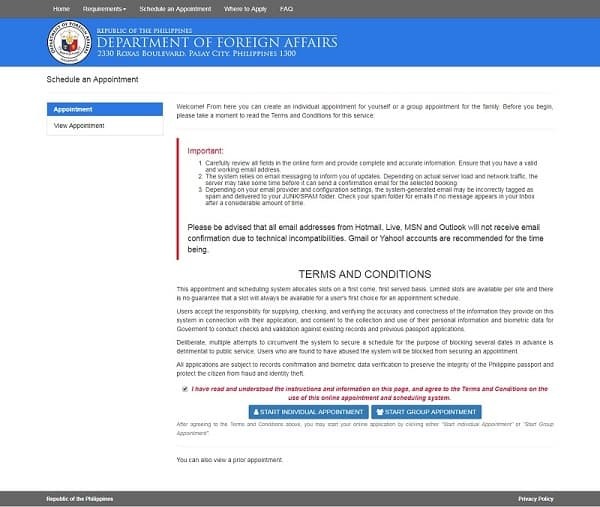 Applicants can only visit the DFA office by appointment. Those who fail to secure an online appointment will not be accommodated. 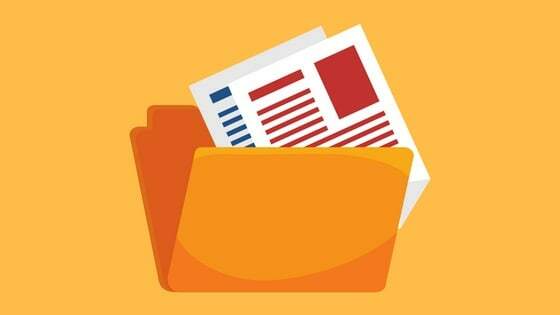 The passport appointment packet is a set of documents that will be sent to your email address after securing an online appointment and paying the processing fee at select ePayment channels (more on this later). Don’t forget to print them out and bring them together with the other requirements on the day of your appointment. All applicants, regardless of age, are required to be physically present on the day of their appointment. 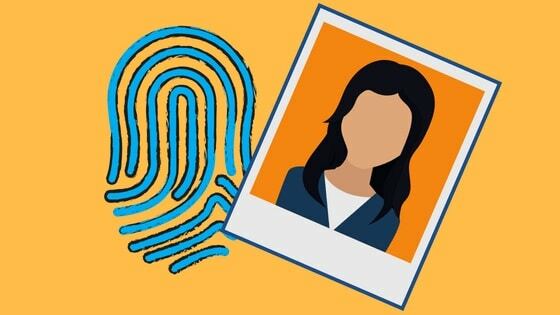 You can’t renew your Philippine passport by mail or through a proxy because of the need to take your biometrics, including your photo and fingerprints. The biometrics are included in the microchip of your passport and serve as an added security feature. If you fail to show up on your appointment, whether due to an emergency or some other reason, you will be barred from making another online appointment for 30 days. Minor applicants (below 18 years old) must be accompanied by either parent or any authorized adult companion (with authenticated Special Power of Attorney executed by the parent/s). The data page refers to the second page of your current/recently expiring/expired Philippine passport. You may bring one valid picture ID issued by the government. Commission on Elections (COMELEC) Voter’s ID or Voter’s Certification from the Election Officer with Dry Seal. Land Transportation Office (LTO) Driver’s License. The student permit is also accepted provided that it’s in card format. Airman License (issued August 2016 onwards). For OFWs or Filipinos based in other countries, you can also bring your Residence Card or any other ID issued by your host government which shows your Philippine citizenship. Important: Only those listed above will be accepted as valid ID. 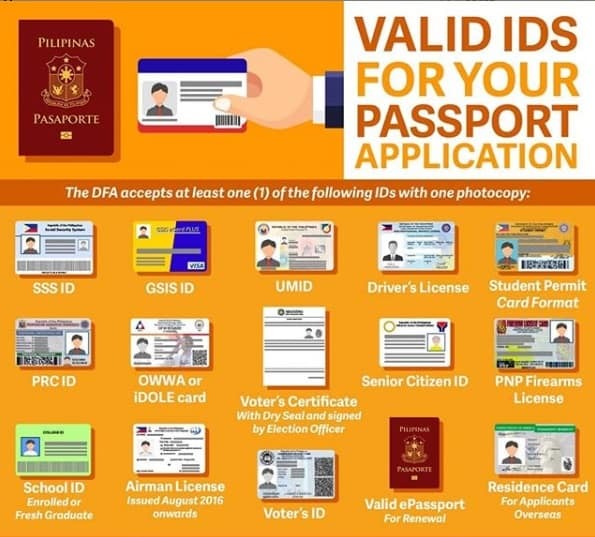 DFA doesn’t accept Postal ID, Philhealth ID, or TIN ID as primary valid IDs for Philippine passport application/renewal. The NBI Clearance only serves as a supporting document, not as a primary valid ID. For the change of name: Original PSA authenticated documents like a marriage contract, annotated birth certificate, annotated marriage contract showing annulment/divorce/court ordered instruction, or death certificate of spouse (whichever is applicable). If you recently married and have decided to continue using your maiden name, the marriage contract will not be required. For lost (or frequently lost) valid ePassport: This will be treated as NEW APPLICATION so an online appointment is required. Supporting documents include Birth Certificate (unless you can submit a photocopy of the last Philippine passport issued to you); original and photocopy of Police Report in English; original and photocopy of the Affidavit of Loss written in English; and a penalty fee of Php 350. Take note that lost valid passports can only be re-issued after a 15-day clearing period. For lost expired ePassport: This will be treated as NEW APPLICATION so an online appointment is required. Documentary requirements include Birth Certificate (unless you can submit a photocopy of the last Philippine passport issued to you); an Affidavit of Loss in English; and a penalty fee of Php 350. 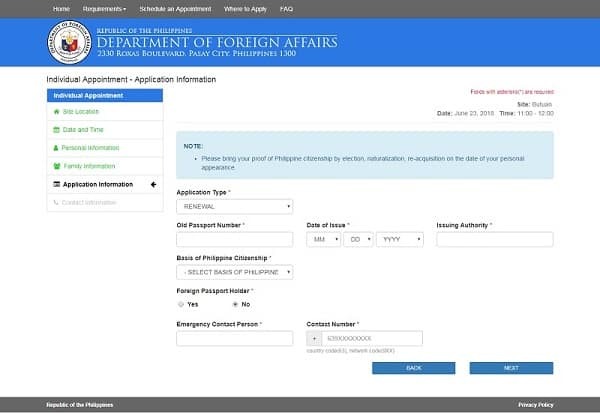 For those who used a travel document to travel back to the Philippines: DFA likewise treats this as a new application that’s why an online appointment is still required. Supporting documents you must bring include the original travel document as well as an Affidavit of Explanation. In case you’ve lost the travel document on your way home, please present an Affidavit of Explanation and the original travel records retrieved from the Bureau of Immigration. For damaged or mutilated passports: This is also considered a NEW APPLICATION, hence requiring an online appointment. Apart from the mutilated or damaged passport/s, please also bring an Affidavit of Explanation and the penalty fee of Php 350. For applicants who are dual citizens: In addition to the basic renewal requirements, you should also bring your Report of Birth or Identification Certificate from the Philippine consulate or the Bureau of Immigration. Another supporting document is any valid government-issued ID in the Philippines or any of its secondary citizenship/residence counterparts. For applicants who are naturalized citizens: Aside from the basic renewal requirements, please also bring an Identification Certificate of Naturalization from the Bureau of Immigration. For applicants who are Filipino citizens by Election: Aside from the basic renewal requirements, please also bring an Affidavit of Election of Philippine Citizenship and an Identification Certificate of Election issued by the Bureau of Immigration. Before we proceed, let me remind you that the DFA online appointment for passport renewal doesn’t apply to everyone. For instance, Filipinos who are based abroad must go to the nearest Philippine Embassy/Consulate/Foreign Service Post to file their applications for passport renewal. There are also applicants who are exempted for passport appointment and can avail of priority/courtesy lanes at any DFA branch/office. Since a lot of applicants are vying for limited slots, and slots get filled up faster than they become available, you have to set an appointment even before planning for your next trip. The customer service will be ready to assist you with your Philippine passport renewal concerns from Mondays thru Fridays, 8 AM to 5 PM. First, go to the Passport Appointment System website. Click “Schedule An Appointment” from the top menu. A pop-up box will appear warning you about fixers. Click the “Start Appointment” button. Warning: Passport appointments are free. Never deal with fixers who are offering online passport appointments in exchange for a fee. Dealing with these shady people is at your own risk. Read the Terms and Conditions which remind you that the passport appointment system offers slots on a first come, first served basis. Tick the box to indicate that you’ve read and acknowledged the content. Click “Start Individual Appointment” (if you’re applying for yourself) or “Start Group Appointment” (if you’re making group appointment on behalf of your family). Choose the DFA branch where you’ll renew your passport. Select the appointment date and time you prefer. Dates that are marked green indicate there are remaining slots left while those marked red mean they’re fully booked. Remember that whatever date you choose, your appointment slot will be reserved for only 15 minutes. After selecting your preferred date and time, tick the captcha box and click the “Next” button. Type in the requested data in the “Personal Information” form. If the applicant is a minor, additional info will be requested. Ensure all the personal details you’ve provided are complete and accurate. Click “Next” to proceed. Provide your parents’ names and citizenship in the “Family Information” form. Click “Next” when you’re done. Enter all the requested details in the “Application Information” form. Since your passport is for renewal, choose “RENEWAL” under Application Type. The “Basis of Philippine Citizenship” is the process through which you became a Filipino citizen. It can be by birth, election, marriage, naturalization, RA 9225, or others. If you became a Filipino by virtue of something other than birth, don’t forget to bring the required supporting documents to prove your citizenship. You will then be taken to a page asking for your contact information. Enter the requested information and click “Next” once you’re done. A summary of all the answers you’ve provided will then appear. Double check for any misspellings, incomplete answers, or wrong details. After ensuring everything is correct, solve the captcha, tick the box that says “I am aware that possession of a passport is a privilege granted by the Government…,” and click the “Confirm” button. Choose the processing type you prefer–either regular processing which costs Php 950 or the express/expedite processing which costs Php 1200. For more information, read the previous section: How much to renew Philippine passport? It is exclusively for the payment of the passport processing fee. The payment must be done within 48 hours after you receive the Reference Number in your email or else the transaction will be canceled. After reading them, tick the box that says “I Agree” and then click the “Proceed to Payment” button. Thanks to the ePayment process launched by the DFA, all applicants can now pay the passport processing fee BEFORE going to the DFA. Note that this is not optional. All applicants are required to submit the payments through the ePayment channels, not directly to the DFA office like we used to do. After clicking “Proceed to Payment” (see the previous step), you will be taken to the newly launched Philippine passport ePayment portal. The page shows the total cost of the passport fee and the list of authorized payment centers or channels where you can pay the said fee. Online payment via credit card or debit card is still under development. Check your email for the reference number. Take note of this number and present it at the Payment Center upon payment of the processing fee. Other Payment Centers, as well as the credit/debit card payment facility, will be made available soon. Remember, you can only confirm your appointment after paying the passport processing fee. Payment must be done within 48 hours after receiving the reference number in your email. Failure to pay it on time will cancel your passport appointment. Aside from the processing fee, you will also be charged an additional Php 50 by the Payment Center as a convenience/service fee. One reference number is equivalent to one transaction. If you’re paying for several reference numbers, separate payments must be done for each reference number. To save time. Whereas in the old system, applicants had to line up just to pay the passport fee in the DFA office, the e-payment system makes it possible for them to pre-pay the same fees in select payment centers before going to DFA. That means one less step to deal with and more time saved for both DFA staff and the passport applicants. To prevent “no-show” applicants. Since the payment occurs prior to going to DFA, applicants with confirmed appointments will be forced to show up lest they forfeit the passport processing fee. To accommodate more passport applicants. Because the payment is now done outside DFA, their staff will now be able to process applications faster and accommodate more applicants. To prevent fixers. With the introduction of the e-payment system where appointments can only be secured with the payment of the passport fee, fixers will find it almost impossible to do under-the-table transactions. After making the payment, keep the receipt issued to you. Bring the above documents along with other documentary requirements to the DFA Consular Office on the day of your appointment. It’s not easy to get an appointment slot so never ruin your chances of having your passport renewed by arriving late. You must be at the DFA office at least 30 minutes before your appointment schedule. If you’ve chosen to renew your passport in one of the DFA satellite offices inside a mall, know that they operate during mall hours. A companion or chaperone is only necessary if you’re a minor, senior citizen, or a PWD. Again, if you fail to show up, DFA will temporarily blacklist your name so you won’t be able to book a slot until a month after your original appointment date. No need to bring passport-sized photos since both your photo and biometrics will be captured during encoding (more on this later). Avoid long queues by choosing an earlier schedule. The earlier you arrive at DFA, the sooner you’ll complete the transaction. Follow the usual dress code for the passport picture. Make yourself presentable and don’t wear sandos/tank tops/sleeveless shirts, spaghetti straps, shorts, tubes, sandals, or slippers. Upon arrival, go straight to the Appointment or Application Counter to present your printed documents. Get a queue number and wait for your turn. Once your number is called, submit all your documentary requirements to the Information Counter or Processing Area for verification. Proceed to the Encoding section where a DFA staff will take your photo, fingerprints, and digitized signature. 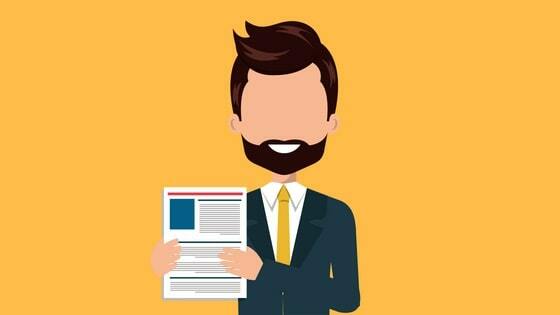 Applicants should show a poker face–no smiling and exposing the teeth to the camera. Remove eyeglasses, contact lenses, earrings, or facial piercings. Don’t wear neck jewelry or turtleneck top. For women, only wear light make-up. In the last step, a DFA staff will either give you a claim stub or write on the back of your official receipt the date when you can claim the passport. For those who are too busy to return to the DFA office, a courier service can deliver your passport to your doorsteps for Php 150. To opt for this service, you can stop by and pay the fee at the Delivery Counter before leaving the DFA office. If you availed of the delivery option before leaving the DFA, your passport will be sent to your doorsteps approximately 1 to 2 weeks after your application. Claim stub or Official Receipt for your passport. Authorization letter with your signature. Your old Philippine passport (if not canceled at the time of application). For those who didn’t pay for the delivery, go back to DFA office and present the Official Receipt at the Passport Releasing section to claim your renewed passport. In case you can’t personally claim the passport, execute a Special Power of Attorney explaining the reasons of your unavailability and let a representative claim the passport on your behalf. In my mock appointment, I noticed that the slots get filled up quickly, so much so that there was no slot left in all DFA Manila branches by the time I tried to book an appointment. a. If you’re a parent of a minor (7 years old and below), you can accompany him/her to the designated priority lanes at any DFA office and get your passport renewed too. No online appointment is required. A senior citizen along with a companion can also avail of the priority lane and have their passports processed at the same time. Take note, however, that some offices have a quota for the number of senior citizens they can accommodate every day. Some DFA branches don’t even accept applications from seniors at all. b. Expand your choices. If all slots at DFA offices in Manila have already been taken, try Regional Consular Offices near you. For example, during my mock appointment, all slots in Manila branches are all filled up. But when I tried to check the regional consular offices, some of them (like in Butuan) have plenty of appointment dates available. Of course, try to reserve a slot from a DFA branch that is closest to your current location. If that’s not possible, and you’re desperate to get a slot, then it doesn’t matter where the DFA office is as long as you can shoulder the travel expenses. c. Check the passport appointment system website every few hours or so, preferably during the wee hours (1 AM onwards). Some people cancel their appointments and the open slots usually reappear during this time. In my case, I managed to book an appointment at 3 AM. It’s a combination of luck and the right timing that will help you secure an appointment. d. Get a slot through travel agencies. These folks are known for booking appointments in bulk. It may cost a lot more but considering all the headaches you may get from doing it on your own, it will be worth every single cent. Hi! please advise po kung ano ang gagawin ng brother ko who will arrive here in Cebu from Canada. Kailangan na kasi nya ma renew ang kanyang Philippine passport asap. (Ma expire ang passport niya by March 2019) Pwede ba siyang mag walk-in agad sa DFA-Cebu Branch? Ilang araw kaya ma release ang new passport? He’ll be staying in Cebu for about 10 days only. Salamat po. Hi nakapag renew ba yung brother mo sa DFA nung asa Cebu or Philippines siya? hi nakapag renew ba yung borther mo ng passport habang asa pinas siya? Hi, is it needed a birth cert to renew a passport? If none please reply immediately so that i can proceed. May I know if birth certificate is still needed for renewal? I think it should no longer be required since it is rediculous to require it again for renewal of passport. Am I right? If you read the article, then you should know birth certificates are only required for minors. Tanong ko lang po kung pwede p po irenew passport ko Feb 16 2011 p po expired kulay green p po passport ko.or pg nag-set ako ng appointment NEW na po application ko? Good day.. may i ask po kelan nagstart ang epayment? Kc po i made an appointment last july 24.. at parang wala pa po ako nabasang kailangan bayaran..
August. If that’s the case, you’ll have to make the payment at the DFA office. Government employee po ako. Hindi ko pa po nagagamit before yung passport ko ngayon po eh nawala. Plan ko po sana irenew sya sa Friday need ko pa po ba magpasa ng affidavit of loss? Hi, can I use “LTO Student Permit” as valid ID? It’s clearly stated by DFA that LTO driver’s license is a valid ID. I don’t know about student’s permit though. Better ask DFA directly. Hello po , tanung q lang po, one year pa lang po passport q , planning to get married next year kelangan q na po b agad erenew ang passport , then change my surname… magwork rin po aq next year abroad..
magkanu po un… anu po ba ggwin.. online schedule po ba ulit? I suggest changing your passport name now to avoid hassles in the future. The same procedure will apply. You can update your name kahit bago o hindi pa expired ang passport mo. Para ka ring magrerenew pero iba yung purpose mo. I have a solo parent id, please advise for any other documents that are still needed for the renewal of my passport? Also, I have a 9 year old son, can I also bring him to process for his passport also? please help. It can still be corrected as long as you present a supporting document ON THE DAY OF YOUR APPOINTMENT. Just tell the passport processor about the error. What if there are typos in the confirmation forms? such as name and birth year? Hi! I made a wrong info in my application form, i misspelled my mother’s name. What should i do? Thanks! Hello, tatanggapin po kaya LTO student permit as govt valid ID? I am planning to get my 6 month old baby her passport and renewing mine in the process. If we don’t need to schedule an appointment but just walk-in and use the courtesy lane, will they accept my payment at the chosen office? Or do I have to do a mock appointment to be able to pay using their new system? @Debbie No need to pay via the new system. 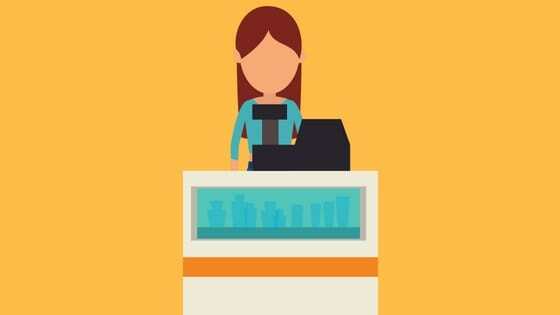 On-site payments are available for those who will avail the courtesy lanes. Can we make minor changes on the home address at DFA on the day of the appointment? @Concerned individual Yes. Just bring a valid ID showing the said home address. Express processing is an option. Please read the article. Thanks. Im booked for an appointment this August, last June I think? Or May and I was still able to confirm my appointment without the epayment section. So does that mean i still need to pay it through the dfa office or through those payment centers? I’m a bit confused. I didnt know there’s a new policy. Simply tell the DFA personnel that you’re able to secure an appointment before the new ePayment system took effect and that you didn’t receive any email confirmation/code to make such payment. I think they will allow you to pay the fee on the day of your appointment. Hello po, Ask lang po ako kasi yong name ko po ginamit ng kapatid ko to get his phil. passport that was 15 years ago , but he never use it . even abroad. pwedi po ba ako kukuha ng passport? in may real name and supporting papers po? Pls help po gusto ko kasi mag travel sa hk with my mom. Thank u po. What are the contents of the checklist? Sorry for the inconvenience. The information you read was a bit obsolete. We’ve already updated the article to include the printed “passport appointment packet” on the list of requirements. 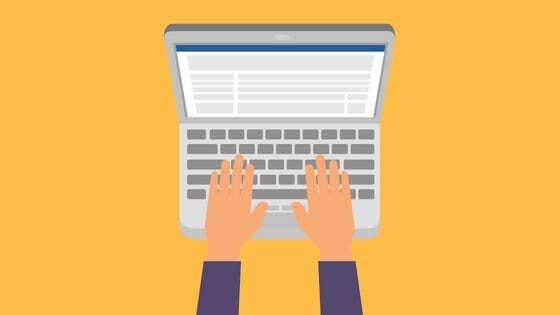 This is a set of documents, which include the application form, that will be sent to your email address once you’ve secured an appointment online and paid the processing fee at select ePayment channels. Thanks for dropping by and showing us the need to update this article. Hi ask ko lang kung pwede ko na ba irenew ang pasaport ko sa till november pa valid nito.